The developing agricultural sector of Philippines has huge potential to explore with the application of hybrid seeds. Hybrid seeds are produced by cross-pollination of plants method, done in home gardening and for commercial modern agriculture. Philippines agricultural sector accounted for 9% export of the total exports in 2016 and the agricultural industry has 10% contribution in GDP. In 2017, Philippines recorded the growth of 2.66% in crops sector, mainly from coconut, sugarcane, banana, pineapple, peanut, cassava, sweet potato, eggplant and rubber production. The growth of agricultural sector is driving the growing demand for hybrid seeds, which is further impacted by the various hybrid seeds research and development programs and projects. One such example is the in the province of Nueva Ecija, where lies the Science City of Muñoz, to carry out agricultural research and innovations. Further, DuPont Pioneer has established its feet in the production of hybrid seeds, which also aims to increase the rice productivity of the Philippines with the hybrid rice seed varieties. Further, the extensive practice of contract farming pose challenges in the growth of hybrid seeds market, as the inputs (hybrid seeds) in agriculture can be diverted from the crop land. Goldstein Research analyst forecast that the Philippines hybrid seed market is set to reach 2 billion by 2025, growing at a CAGR of 10.6% over the forecast period (2017-2025). Grain hybrid seeds accounted for the largest market share of 38.4% in 2017. Rice being the staple crop and has huge demand drives the development of the hybrid rice seeds, followed by the development of hybrid corn seeds. The report covers the present ground scenario and the future growth prospects of Philippines Hybrid seeds market for 2017-2025 along with the market players’ analysis. We calculated the market size and revenue share on the basis of revenue generated from major players in the Philippines region. Philippines Hybrid seeds market is forecasted on the basis of hybrid seeds production and hybrid seeds supply and agricultural produce in the region. Philippines Hybrid seeds Market Outlook 2017-2025, has been prepared based on an in-depth market analysis from industry experts. 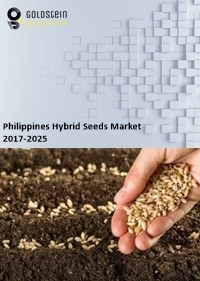 The report covers the competitive landscape and current position of major players in the Philippines Hybrid seeds market space. The report also includes porter’s five force model, SWOT analysis, company profiling, business strategies of market players and their business models. “Philippines Hybrid seeds Market Report” also recognizes value chain analysis to understand the cost differentiation, pricing models to provide competitive advantage to the existing and new entry players. Our Philippines Hybrid seeds Market Report comprises of the following companies as the key players: Dow, DuPont, MacBio Co., ARK International Ventures Inc., NH Global Solution, kaye domingo, East West Hybrid seeds.